Decisions, big and small, are a part of EVERYONE’s life. How we make those decisions is often something we’ve acquired from our parents, family, and friends. But is that really the best way? Emily’s book, The Next Right Thing, encourages you to step back, create a little space, and look at the decision in front of you. Reading through this book, with chapters like “Look for Arrows”, “Find a No Mentor”, and “Be Where You Are” – you’re bound to find yourself relating to at least one of these situations. And the book will help prepare you for decisions yet to come (and there’s always a decision in your future). Short chapters, easy to digest – yet deep in context. I encourage you to read the book all the way through, then go back and work through the chapters that really speak you at the moment. Keep the book as a reference for future decisions that you just don’t quite know how to proceed making. Emily has a wonderful way of expressing our desire to balance self, faith, and life within the realities of everyday living. This book will help you peel back the layers of indecision (if that’s you), or slow down the “full speed ahead” (if that’s you). 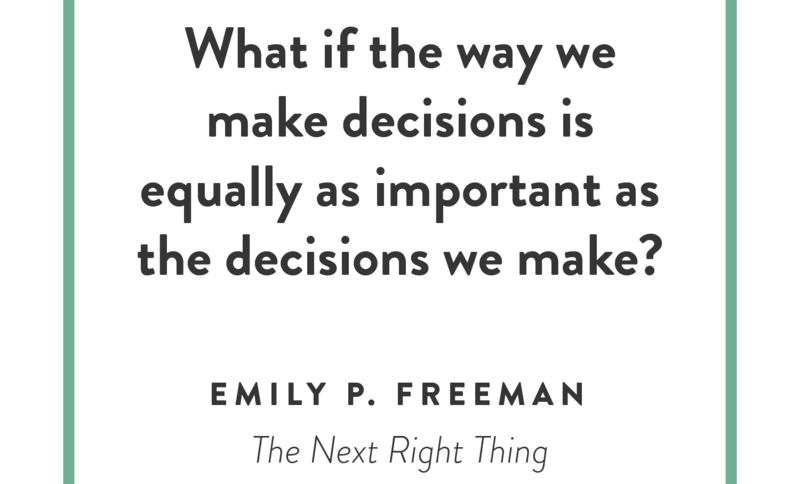 One of my favorite lines from the book is “It’s not a black-and-white world, which means decisions are rarely right or wrong.” It really takes some of the pressure off to “make the right decision”. So, even if you don’t appear to have trouble making decisions, or don’t have anything major coming up – this book is still for you. You’ll examine your heart, your head, your inner self – and you’ll be better for it. I’ll look for it then. Life is definitely not black and white. Lots of grey.